The Anglin siblings were part of a close knit family who stayed in contact despite their geographic separation through their corrspondence. Siblings wrote and exchanged lengthy letters that document not only family news, but also news of local and national significance. Topics addressed in their letters include World War I, the Irish revolution, medicine, religious ministry, and domestic issues ranging from the ability of a single woman to support herself to child rearing. Anglin family and friends, ca. 1921. In the early twentieth century, seven siblings of the Anglin family of County Cork, Ireland, made their way to Canada and the United States. Their correspondence with one another depicts their adjustment to this transition, as well as the many high and low points of their lives. World War I would claim the life of one of the siblings; other Anglins would suffer disease, natural disasters, and various kinds of discrimination. Despite these challenges, the Anglins were largely successful. One of the brothers became a physician, one was a salesman for a large meat-packing company, and two were Protestant ministers. The eldest daughter was a teacher of home economics, the middle daughter a homemaker, and the youngest trained as a nurse, until she suffered a disabling illness. Throughout their lives, the siblings maintained a strong connection with one another and with other family members through their correspondence. Anglin family historians have posited that their ancestors were Huguenots-French Protestants-who fled religious persecution to settle in southern Ireland in the late 1500s. The first Anglins of County Cork can be traced to Robert Anglin, who was born in 1775. Robert had three siblings, including a brother, Samuel, who was born in 1780. Samuel, who may have been married twice, had eight children. One of those children, William Anglin, married Elizabeth Duke in 1842, together they had six children, including John, the father of the seven Anglin siblings who would later immigrate to Canada and the United States. John and his wife Mary Jane (Waugh) Anglin also had an eighth child, John Walter, who died in his first year of life. John and Mary Jane "May" Anglin were well-to-do. John worked as an agent for the Liverpool, London, and Globe Insurance Company in the city of Cork. Situated on a hill overlooking the city was the Anglins' spacious Georgian home, which they had named "Mount Nebo," after the mountain in Jordan from which, according to tradition, Moses had glimpsed the Promised Land. Ruby G. Jackson, a granddaughter of John Anglin who brought her mother, Ida, to visit her former family home, was surprised to see that it was so elegant and large. Today, though somewhat deteriorated in condition, the Anglin's former home serves as a convent. An interest in religious matters weaves a common thread through Anglin family history. The Anglin siblings' mother, Mary Jane Waugh, was a descendant of Huguenots. Members of her family, along with members of the Anglin family, together built the only Methodist church in Cork, Ireland in the 1800s. Richard William "Will" Anglin, the eldest of the seven Anglin siblings who immigrated to Canada, would become a Presbyterian minister, and John Crawford, the youngest of the Anglin brothers, would study to become a Methodist minister. Florence ETHEL Anglin, born May 31,1878, was the eldest of the Anglin children, and as such she held a prominent role in the family. Ethel Anglin was unmarried, but lived with a woman, Sadie Donaldson, for her entire adult life. Ethel taught Domestic Economics at a technical school in Bray, Ireland. She remained in Ireland through World War I and the early years of unrest in the 1920s, while her siblings, Will, Sydney, George, Crawford, and Gladys emigrated to Canada. By 1924, ill with heart disease and phlebitis, Ethel resigned her teaching position and was awarded a pension. That spring she and Sadie joined her family in Canada. Ethel remained near her siblings until her death on May 12,1959. Richard William "WILL" Anglin was born on October 27, 1880 and immigrated to Canada in 1903. He graduated with a Bachelor's degree in Theology from Queen's University in 1908 and then went on to study at Glasgow University (1909-1910) and in Halifax, Nova Scotia. On August 23, 1916 he married Alice Ethel Wathen, who had been born in 1888 in Harcourt, New Brunswick. Ethel had at least two sisters, one named Alethea and one named Jennie. Alethea went to a university in Toronto and met Nell and Sydney in 1918. Will was a minister at St. John's Presbyterian Church in Windsor, Nova Scotia from around 1915-1926. During their time in Windsor, Will and Ethel had three children named Dorothy, Alice, and Walter. They lived in the Manse, which was housing provided by St. John's Church. Around 1926 or 1927 Will and Ethel left Windsor for St. Stephen, New Brunswick where Will took up a new ministry. Will was a minister at many locations in Canada including Nova Scotia, New Brunswick, and Ottawa. There is very little information about their lives in later years. Will died in Ottawa on Christmas Day in 1956, and Ethel died in 1974. IDA Josephine Anglin was born on April 13, 1883 and married David Jackson, an Irish farmer, on January 10, 1912. The couple had reservations for their honeymoon on the R.M.S. Titanic for its fateful maiden voyage, but were bumped from the passenger list because the sailing had been overbooked. They took their honeymoon on another ship. Ida and David settled in the Boston area and then moved to Three Rivers, which is part of the town of Palmer, in Western Massachusetts. Ida and David had their first daughter, Bertha, in 1914, and their second daughter, Ruby, in 1916. Their daughter Olive was born the next year, and then the youngest, Vida, in 1920. In the United States, David Jackson worked as a laborer, but he used his farming skills as well. In 1921 or 1922, the Jacksons moved to nearby Monson, Massachusetts, where they purchased seven acres of land. Ruby Jackson recalls that the Monson property cost her parents $5,000. Ruby also remembers that the property was "like the Garden of Eden." When they bought it, the land was already supporting a variety of fruit trees, such as heirloom apples, three kinds of pears, two kinds of cherries, and plums. David Jackson added extensive vegetable gardens to their acreage, including a large section of potatoes.As the only Anglin sibling who moved to the United States, Ida was separated geographically from her brothers and sisters. David Jackson died on May 29, 1955. Ida Jackson died on December 9, 1971. Both are buried in Hillside Cemetery in Monson, Massachusetts. SYDNEY Ernest Anglin was born on July 12, 1885. Along with his elder brother, Will, Sydney immigrated to Canada in October of 1903. He and Will stayed for a short time in Montreal with their father's brother, Richard Duke "R.D." Anglin, and his wife Minnie. Sydney established a successful career as a salesman for the Harris Abattoir Company, a Toronto slaughterhouse and meatpacking firm which later became Canada Packers. When Sydney visited Ireland, he brought his younger brother George with him to Toronto on the return trip. Sydney loaned George the tuition for his medical degree at the University of Toronto, and then persuaded George to attend his own graduation ceremony in 1914. This was fortunate for George, since he had booked passage, at the time of his graduation, on the Empress of Ireland, a ship that sank on its way to Europe with enormous loss of life. On January 12, 1916, Sydney married Nellie Cecilia J. Carman. On December 20, 1918, their son was born; they named him Crawford Sydney after John Crawford Anglin, Sydney's brother, who died in World War I. In a 1941 Crawford has passed his fourth year in medicine and began studying Obstetrics that fall. Sydney died on May 9, 1957, and Nell died on January 14, 1966. GEORGE Chambers Anglin was born on January 29, 1890 and came to Canada with his brother Sydney who had returned to Ireland for a visit. Sydney loaned George the funds to attend the University of Toronto Medical School, from which George received his medical degree in 1914. George joined the British infantry as a medical officer soon after the outbreak of World War I. He was stationed with the British Expeditionary Forces in France and served in the 1916 Battle of the Somme, in which over 19,000 British soldiers died on the first day of fighting. Sadly, George's own brother Crawford was killed in Ypres, Belgium, in June 1916. George resided at Calydor, a sanatorium in Gravenhurst, Ontario from late in 1918 until he was cured of tuberculosis in March of 1919. Probably while he was at Calydor, George met Dr. Ruth Cecilia Cale, another chest specialist. Dr. Cale had earned her medical degree from Toronto University in 1916. George and Ruth exchanged jobs between the Mountain Sanatorium and the Muskoka Tuberculosis Sanatorium, which was near Gravenhurst. In 1920, George purchased a small house at 233 Annette Street in Toronto. He had a small private practice at his house and later at an office at 468 Church Street. He also worked in hospitals. On November 23, 1920, George Anglin married Ruth Cecilia Cale, and they took up residence together at 233 Annette Street. George continued to be very active in the medical field, publishing articles about tuberculosis in professional journals and serving as a Corresponding Associate Editor on the journal, Diseases of the Chest. Ruth Cecilia Cale Anglin served as an active church member at both the local and the national level. George and Ruth had four children: Marion Ruth, Douglas George, Mildred Maud, and Robert Sydney. George C. Anglin died on April 14, 1948. Ruth Anglin died on August 26, 1983. John CRAWFORD Anglin was born on March 10, 1892 and immigrated to Canada in 1909. He worked in Toronto and Winnepeg at the Harris Abattoir, the same company where his brother Sydney was a salesman. Crawford studied for the ministry at Alberta College in Edmonton South and his name is listed as the president of the Probationer's Association, Alberta Methodist Conference on company stationery. He had an emergency appendectomy on February 15, 1915; the operation was performed on his niece Bertha Jackson's first birthday. By September 24, 1915 Crawford had enlisted in the 4th University Overseas Company that was to support the "Princess Patricia" Canadian Light Infantry in Europe. He left Edmonton for training on October 6, 1915 and arrived in France in March of 1916. Crawford died on June 4, 1916, saving the life of a wounded soldier named Simmonds. On a large monument in the Ypres area, his name is included with those of 55,000 soldiers from the British Commonwealth who were missing in Belgium. Two years after Crawford died, Sydney's wife Nell gave birth to a son, whom the couple named Crawford Sydney. GLADYS Mabel Anglin was born in Ireland on December 10, 1894. She immigrated to Canada some time between 1914 and May of 1917. During the 1910s, Gladys enrolled in a nursing program and worked at a Canadian department store before taking a job at the Railway Office in 1920. The following year she was afflicted by an unidentified mental illness, which required long-term hospitalization. There were some earlier indications of Gladys' troubled mental state. While there was no clear explanation offered for her hospitalization, George and his siblings often referred to her condition. For part of 1921 and all of 1922 it appears that Gladys resided at the Ontario Hospital, Whitby, Ontario. This hospital was considered a model psychiatric hospital at the time and it served as a convalescent hospital for soldiers wounded in World War I. A nursing school also operated at the facility from 1920 to 1972. It is unclear whether Gladys married; she died on August 12, 1966. RUBY Gladys Jackson was born in Massachusetts on September 3, 1916 to Ida and David Jackson. She moved with her family to Monson, Massachusetts when she was around five years old. Ruby graduated from Monson High School in 1933. She began her undergraduate education at Mount Holyoke College in 1933, but had to take seven years off between her second and third years of college to earn enough money to continue. She graduated from Mount Holyoke in 1944. Ruby wanted to attend Harvard Medical School in 1945, but was discouraged from doing so as a female applicant. She attended the medical school of McGill University instead, and became the first female resident in obstetrics and gynecology in Boston. She later worked in that specialty in the Boston area. Ruby had wanted to become a surgeon, and had worked for a surgeon for several years, but was told by various doctors that a female surgeon would never be accepted in Boston. Retired now from medical practice, Ruby currently resides in an assisted living community in Concord, Massachusetts. ANNIE Jackson Ballinary, the sister of David Jackson, lived in Ireland with her husband and daughter, Maud. The Anglin Family Papers provide a unique record of an Irish immigrant family's efforts to remain in contact across great distances. The bulk of the collection consists of a network of letters, many of which were circulated throughout the family, presumably as a means of sharing information more thoroughly and efficiently. The prevailing theme of the correspondence is family news, and most content refers to the health, well-being, and daily activities of family members. Births, deaths, holidays, weddings, and anniversaries are all mentioned. Other topics include the Irish revolution, medical and ministerial issues, and World War I. While the bulk of the collection represents the time period 1914-1926, there are some materials from the 1940s, in particular a series of letters that relate to the joint wedding of Bertha and Olive Jackson, daughters of Ida and David Jackson. Bertha married Paul Frederick Fisher and Olive married Arthur John Roberston Dobles; both couples wed on June 21, 1941. Every Anglin sibling is well represented within the collection with the exception of Ida. There is one outgoing letter by Ida to her aunt Clara and a couple of notes or lists that she kept; the remainder are letters addressed to her or forwarded to her by siblings. Ethel Anglin wrote numerous detailed letters to her siblings both in Canada and the United States during the 1910s and 1920s. As the sibling who remained in Ireland the longest, she often expresses her loneliness as well how much she misses her brothers and sisiters, and asks to hear back from all with details of their lives. Her letters reveal her to be a devout Protestant and she writes on several occasions to report on services, meetings, and functions at church while reminding her siblings to trust in God. In the 1914, Ethel writes about a wide range of topics from the sale of furniture and the breaking up of household to her mother's move into a new home. Letters in subsequent years contain references to the First World War and its effects on family, friends, and the community including the difficulties of daily life, her teaching and work duties, food shortages, their brother Crawford's heroic death in the war, and outbreaks of the Spanish Influenza epidemic and smallpox. Ethel puts her home economics knowledge to good use by offering advice to her siblings on home repair and decoration, family health issues, and marriage. She also sent news of local marital gossip. By 1919 Ethel writes of her ill health, of the war's end, and of the brewing political upheaval in Ireland. In the letters of the 1920s, Ethel writes that emigration from Ireland has been stopped for six months, and the country is "in a fearful state." Food prices are very high, and she relates stories of rebels roaming the streets, shootings occurring in the area, homes being invaded, and people being murdered. In a letter dated December 28, 1922, Ethel describes an incident that takes place at her house in the middle of the night: she and Sadie are awakened by a band of men banging on their front door. They remain quiet in the dark until the men eventually give up and leave. On another occasion she was stopped in the street by a man with a gun. It is during this time that Ethel and Sadie discuss plans to immigrate to Canada. By 1924 Ethel writes to Sydney that she and Sadie are so attached to one another that "wherever one goes, both will go [and Sadie] will be happy with me, as she always is, and I am always with her." There is a gap in Ethel's correspondence from April, 1926 until two letters appear from 1941. She and Sadie are living in Canada with her sister Gladys, and she writes of restrictions on travel and on the postal service imposed due to World War II. These restrictions prohibit any Anglins from attending the wedding of Ida's daughters, Bertha and Olive, in the United States. She gives advice on the wedding invitations and party menu and relates news of two of their nephews: Crawford (son of Sydney and Nell) completed his medical studies and Walter (son of Will and Ethel) completed his course in Dentistry at Mount Allison University and was accepted at McGill University to further his studies. The majority of Will and Alice Ethel Anglins's letters document their time living in Windsor, Nova Scotia. Both Will and Ethel write to his siblings about his ministry, their children, financial troubles, and illnesses in the family. During his ministry at St. John's, Will has the opportunity to travel around Canada to attend lectures and Synods. He attends a Synod at Presbyterian College in 1920 where he hears Robert Falconer speak. In many letters Will expresses concerns about the troubles in Ireland at the time, including the execution of Robert Childers. George Anglin's letters begin when he is serving with the British Expeditionary Forces in France in 1916. In these he asserts his belief that his brother, Crawford, who is missing in action has died in battle. Later letters from Mountain Sanatorium, where George both gave and received treatment, confirm this belief and describe the heroic manor in which Crawford dies saving the life of a fellow soldier. On April 16, 1918, George reports a large fire at the Harris Abattoir Company, a slaughterhouse and meatpacking company where his brother, Sydney, had worked as a salesman: "almost a million dollars worth of damage was caused and a lot of food, so precious now, destroyed." Later letters from George and his wife Ruth relate family news about two of their children, Marion and Douglas. Gladys Anglin's correspondence dates from 1914 through 1924, and is primarily addressed to her sister Ida, with a couple of letters to her sister Ethel. In her letters she discusses her nursing studies and hospital work, as well as her own physical ailments. She documents her visits to Sydney and George in Ontario, and relates family news from both Canada and Ireland. There is some discussion of the deadly flu epidemic of 1918, which effected several family members. In a letter she wrote to Ida in May of 1918, which she did not want shared with other family members, she describes an odd sleepwalking episode. While it is not clear what condition Gladys was treated for during her stay at the Ontario Hospital, there are suggestions both in the her letters and those of her siblings that she has a fragile mental state. In September 1921, Gladys asks her sister Ethel why she has not written to her in so long; she suspects it is because Ethel thinks that she is not fit for letters, while in reality she longs for them. That same month Ethel writes Gladys congratulating her for being an operator of the hospital switchboard: "Why in a short while I shall be expecting to hear you are being allowed out...are you able to sleep better now?" At the end of December in 1922, Ethel writes to her sister Ida, concerned because she had not heard from Gladys, adding, "it is a terrible pity about her condition, and awful to think of all her money going to Whitby." Ethel also writes that she and Sadie are thinking of moving to Canada for good, and would like to have Gladys live with them, a hope that is ultimately realized. Occasional and unidentified correspondents are filed together as general correspondence. Letters from family members who are identified by first names only are filed under their forename. Newspaper clippings include press accounts of Crawford Anglin's heroic actions leading up to his death; these accounts were published two years after Crawford went missing during battle and was presumed dead. 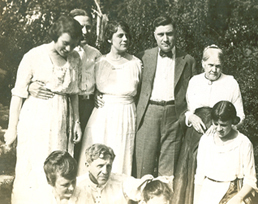 The collection includes only ten photographs: two are filed with Gladys Anlgin's correspondence from the early 1920s and feature family members Gladys, Nell, Sydney, and baby Crawford; six are filed with Annie Jackson Ballinary's letters from the early 1920s, and the other two are filed under photographs and feature a young Bertha Jackson aged four and a post mortem image of an unidentified man, most likely David Jackson who died in 1955. Consists of miscellaneous notes including instructions for refooting a stocking by patching notes on the progress of one of Ida's daughters. Post-mortem photograph of unidentified man, most likely David Jackson. Mailings from engravers and bridal shops seeking the business of Ida Jackson on behalf of her daughters, Bertha and Olive, who both wed on the same day in 1941. Acquired from Danielle Kovacs, 2010. Processed by Simmons GSLIS West students. Fall 2010. Cite as: Anglin Family Papers (MS 699). Special Collections and University Archives, University of Massachusetts Amherst Libraries.